This Lease is dated as of the lease reference date specified in the Summary of Basic Lease Terms and is made by and between the party identified as Landlord in the Summary and the party identified as Tenant in the Summary. D. Premises: That area consisting of approximately ________ square feet of gross leasable area on the ______ floor of the building located at __________________. Such gross rentable area includes a proportionate share of the size of the Common Area entrance lobby to the Building and the rear fire exit lobby. The parties agree that the foregoing square footage of the Premises (including the proportionate share of the Common Area lobby) is deemed the actual gross rentable area of the Premises. E. Project: The land, the Building and other improvements shown on Exhibit A consisting of multiple buildings the aggregate gross leasable area of which is __________ square feet as of the date of this Lease. The gross leasable area of the Project referred to above shall be deemed the actual gross leasable area in the Project. F. Building: The building in which the Premises are located having an address of _____________, and containing approximately _________ square feet of gross leasable area. The gross leasable area of the Building referred to above shall be deemed the actual gross leasable area in the Building. G. Tenant’s Share: ________% of the Building (i.e., ______ square feet of gross leasable area in the Premises divided by _____ square feet of gross leasable area in the Building); and ______% of the Project (i.e., ________ square feet of gross leasable area in the Premises divided by ________ square feet of gross leasable area in the Project). H. Tenant’s Allocated Parking Stalls:_____ parking spaces. J. Lease Term: ____ calendar months (plus the partial month following the Commencement Date if such date is not the first day of a month). If the Commencement Date is other than the first day of a calendar month, the first month shall include the remainder of the calendar month in which the Commencement Date occurs plus the first full calendar month thereafter. Notwithstanding the foregoing, if the Commencement Date is other than the first day of a calendar month, the first month of the Lease Term will include the partial month in which the Commencement Date occurs plus the next full calendar month, but the Rent Abatement Period in such case will consist of the first 30 days from and including the Commencement Date. Base Monthly Rent (prorated on the basis of Base Monthly Rent in the amount of $________) and “Tenant’s Share” of “Common Operating Expenses” for the remainder of such first month in the Lease Term will be prorated on a daily basis. Base Monthly Rent and Additional Rent for Tenant’s Share of Common Operating Expenses (as such terms are hereinafter defined) shall not be due and payable during the Rent Abatement Periods. L. Prepaid Rent: $_________ (i.e., $_________ for Base Monthly Rent, plus $_________ for Tenant’s Share of Common Operating Expenses), that first become due under this Lease. N. Permitted Use: General architectural office, research and development, engineering, marketing, sales, storage and other legal uses incidental thereto. S. Retained Real Estate Brokers: ____________________ of __________________ representing Landlord, and ________________ representing Tenant. 1.1 General: Any initially capitalized term that is given a special meaning by this Article 1, the Summary, or by any other provision of this Lease (including the exhibits attached hereto) shall have such meaning when used in this Lease or any addendum or amendment hereto unless otherwise clearly indicated by the context. 1.2 Additional Rent: The term “Additional Rent” is defined in Section 3.2. 1.3 Address for Notices: The term “Address for Notices” means the addresses set forth in the Summary. 1.4 Agents: The term “Agents” means the following: (i) with respect to Landlord, the employees and agents of Landlord; and (ii) with respect to Tenant, the employees, contractors, agents and invitees of Tenant and Tenant’s subtenants and their respective agents, employees, contractors, and invitees. 1.5 Agreed Interest Rate: The term “Agreed Interest Rate” means that interest rate determined as of the time it is to be applied that is equal to the lesser of (i) 5% in excess of the discount rate established by the Federal Reserve Bank of __________ as it may be adjusted from time to time, or (ii) the maximum interest rate permitted by Law. 1.6 Base Monthly Rent: The term “Base Monthly Rent” means the fixed monthly rent payable by Tenant pursuant to the Summary. 1.7 Building: The term “Building” means the building in which the Premises are located which Building is identified in the Summary. 1.8 Commencement Date: The term “Commencement Date” means the later of: (i) __________; or (ii) the date on which all of the following have occurred: (a) the “Tenant Improvements” to be constructed by Landlord pursuant to Exhibit B have been “Substantially Completed,” subject to “Tenant Delays” and “Force Majeure Delays” (as such terms are defined in Exhibit B attached hereto), (b) Landlord has delivered possession of the Premises to Tenant. However, if there is any delay in Substantially Completing the Tenant Improvements due to any Tenant Delay, the date calculated under clause (ii)(a) and clause (ii)(b) above will be the date the Tenant Improvements would have been Substantially Completed but for such Tenant Delay(s). Thus, the date for commencement of Rent shall not be delayed by Tenant Delay. 1.9 Common Area: The term “Common Area” means all areas and facilities within the Project that are not designated by Landlord for the exclusive use of Tenant or any other lessee or other occupant of the Project, which in any event shall include the parking areas, access and perimeter roads, pedestrian sidewalks, landscaped areas, trash enclosures, recreation areas. 1.10 Common Operating Expenses: The term “Common Operating Expenses” is defined in Section 8.2. 1.11 Effective Date: The term “Effective Date” means the date the last signatory to this Lease whose execution is required to make it binding on the parties hereto shall have executed this Lease. 1.12 Event of Tenant’s Default: The term “Event of Tenant’s Default” is defined in Section 13.1. 1.13 Hazardous Materials: The terms “Hazardous Materials” and “Hazardous Materials Laws” are defined in Section 7.2E. 1.14 Insured and Uninsured Peril: The terms “Insured Peril” and “Uninsured Peril” are defined in Section 11.2E. 1.15 Law: The term “Law” means any judicial decision, statute, constitution, ordinance, resolution, regulation, rule, administrative order, or other requirement of any municipal, county, state, federal or other government agency or authority having jurisdiction over the parties to this Lease or the Premises, or both, in effect either at the Effective Date or any time during the Lease Term, including, without limitation, any Hazardous Material Law (as defined in Section 7.2F) and the Americans with Disabilities Act, 42 U.S.C. §§ 12101 et. seq. and any rules, regulations, restrictions, guidelines, requirements or publications promulgated or published pursuant thereto (“ADA”). 1.16 Lease: The term “Lease” means the Summary and all elements of this Lease identified in the Summary, all of which are attached hereto and incorporated herein by this reference. 1.17 Lease Term: The term “Lease Term” or “Term” means the term of this Lease which shall commence on the Commencement Date and continue for the period specified in the Summary. 1.18 Lender: The term “Lender” means any beneficiary, mortgagee, secured party, lessor, or other holder of any Security Instrument. 1.19 Permitted Use: The term “Permitted Use” means the use specified in the Summary. 1.20 Premises: The term “Premises” means that building area described in the Summary that is within the Building. 1.21 Project: The term “Project” means that real property and the improvements thereon which are specified in the Summary. Landlord reserves the right, in its sole and absolute discretion, to include such other buildings in the Project, to sell, transfer, assign or otherwise dispose of any building or parcel in the Project and elect to remove such building and/or parcel from the Project. 1.22 Private Restrictions: The term “Private Restrictions” shall mean all recorded covenants, conditions and restrictions, private agreements, reciprocal easement agreements, and any other recorded instruments affecting the use of the Premises which are recorded after the Effective Date and do not materially interfere with Tenant’s use and occupancy of the Premises under the terms of the Lease, unless Tenant approves of such newly recorded Private Restrictions. 1.23 Real Property Taxes: The term “Real Property Taxes” is defined in Section 8.3. 1.24 Scheduled Commencement Date: The term “Scheduled Commencement Date” shall mean the date specified in the Summary. 1.25 Security Instrument: The term “Security Instrument” means any underlying lease, mortgage or deed of trust which now or hereafter affects the Project, and any renewal, modification, consolidation, replacement or extension thereof. 1.26 Summary: The term “Summary” means the Summary of Basic Lease Terms executed by Landlord and Tenant that is part of this Lease. 1.27 Tenant’s Alterations: The term “Tenant’s Alterations” or “Tenant’s Alteration” or “Tenant Alteration” means all improvements, additions, and alterations installed in the Premises by Tenant. 1.28 Tenant’s Share: The term “Tenant’s Share” means the percentage obtained by dividing Tenant’s gross leasable area in the Premises (as set forth in the Summary) by the gross leasable area of the Building, which as of the Effective Date is the percentage identified in the Summary. 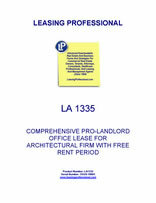 2.1 Demise of Premises: Landlord hereby leases to Tenant, and Tenant leases from Landlord, for the Lease Term upon the terms and conditions of this Lease, the Premises for the Permitted Use in the conduct of Tenant’s business together with (i) the non-exclusive right to use on an unreserved basis, free of charge (except for Common Operating Expenses and Taxes), the number of Tenant’s Allocated Parking Stalls within the Common Area (subject to the limitations set forth in Section 4.5), and (ii) the non-exclusive right to use the Common Area for ingress to and egress from the Premises. Landlord reserves the use of the exterior walls, the roof and the area beneath and above the Premises, together with the right to install, maintain, use, and replace ducts, wires, conduits and pipes leading through the Premises in locations which will not materially interfere with Tenant’s use of the Premises. 2.2 Commencement Date: The Lease Term starts on the Commencement Date, notwithstanding any early occupancy by Tenant pursuant to Section 2.5 hereof. 2.3 Construction of Improvements: Landlord agrees to construct the Tenant Improvements in accordance with the terms of Exhibit Band to use its commercially reasonable efforts to Substantially Complete such work by the Scheduled Commencement Date, subject to “Tenant Delays” and “Force Majeure Delays” (as such terms are defined in Exhibit B attached hereto). 2.4 Delivery and Acceptance of Possession: If Landlord is unable to deliver possession of the Premises to Tenant on or before the Scheduled Commencement Date with the Tenant Improvements Substantially Completed (as defined in Exhibit B), for any reason whatsoever, then this Lease shall not be void or voidable except as provided in this paragraph, and Landlord shall not be liable to Tenant for any loss or damage resulting therefrom. Notwithstanding the foregoing or anything to the contrary contained in this Lease, (a) if the Commencement Date has not occurred on or before __________ (as extended for Tenant Delays and Force Majeure Delays, as defined in Exhibit B), then Landlord shall reimburse Tenant for the Holdover Delay Payment (hereinafter defined) for the time period that the Commencement Date is delayed beyond __________ (as extended for Tenant Delays and Force Majeure Delays) through the earlier of thirty (30) days after the Commencement Date occurs or such earlier date that Tenant ceases to be obligated to pay holdover rent under the Existing Lease (hereinafter defined), and (b) if the Commencement Date has not occurred on or before __________ (as extended for Tenant Delays and Force Majeure Delays), then Tenant, as its sole and exclusive remedy (in addition to the payment by Landlord of the Holdover Delay Payment as provided below), may terminate this Lease by written notice to Landlord prior to the actual Commencement Date, whereupon any monies previously paid by Tenant to Landlord shall be reimbursed to Tenant, and Landlord shall pay the Holdover Delay Payment to Tenant through __________, but not for any period thereafter, to such extent such payment is due the landlord under the Existing Lease. Under no circumstances will Landlord pay more than $___________ in Holdover Delay Payment even if the Commencement Date is delayed beyond __________ and Tenant does not elect to terminate the Lease as provided above. The “Holdover Delay Payment” equals $_________ per month, which represents one-half of the additional premium for the holdover rent that Tenant pays to its current landlord for Tenant’s lease of space at ______________________________ (the “Existing Lease”). If the landlord under the Existing Lease reduces or does not charge rent at the holdover rate under the Existing Lease, Landlord’s Holdover Delay Payment will be reduced according to equal one-half of the additional premium for holdover rent for the Existing Lease. Landlord will make the Holdover Delay Payment to Tenant either in a lump sum payment within 10 days after the Commencement Date or as a credit against Base Monthly Rent and Additional Rent coming due under this Lease. Notwithstanding anything to the contrary contained in this Lease, Landlord warrants and represents that as of the Commencement Date, (i) the Premises will comply with all Laws, except for any improvements required due to Tenant’s particular use of the Premises, the particular manner in which it conducts its business in the Premises, or any Trade Fixtures or Tenant Alterations made by Tenant, (ii) the Tenant Improvements and the Premises will be in good and clean operating condition and repair, (iii) the electrical (including outlets and panels), mechanical, HVAC, plumbing, sewer, elevator, sprinkler (including interior and exterior landscaping) and other systems serving the Premises and the Building as well as the lighting, ceiling tiles and window coverings in the Premises and the parking lot will be in good operating condition and repair, and (iv) the roof (including the roof membrane) of the Building will be in good condition and water tight. During the first six (6) months after the Commencement Date, Landlord shall, promptly after receipt of notice from Tenant, remedy any non-compliance with such warranty at Landlord’s sole cost and expense, except if such work is required due to (a) the negligence, willful misconduct or misuse by Tenant or any of its Agents, or (b) the installation of any Trade Fixtures or Tenant Alterations, in which case Tenant shall be solely responsible for the cost of such work. Subject to the foregoing, Tenant acknowledges that it has had an opportunity to conduct, and has conducted, such inspections of the Premises as it deems necessary to evaluate its condition. Except as otherwise specifically provided herein, Tenant agrees to accept possession of the Premises in its then existing condition, “as-is”, including all defects, except for any defects in the structural parts of the Building (which for purposes hereof shall mean the foundation, load bearing walls and roof structure). At the time Landlord delivers possession of the Premises to Tenant, Landlord and Tenant shall together execute an acceptance agreement in the form attached as Exhibit C, appropriately completed. The failure of Tenant to execute such Acceptance Agreement shall not extend or delay the Commencement Date. 2.5 Early Occupancy: Tenant may enter the Premises on or after ____________ at its own risk solely for the purpose of making such improvements as Tenant shall have the right to make, including without limitation, and to install fixtures, supplies, inventory and other property (“Early Occupancy”). Tenant agrees that it shall not in any way interfere with the progress of Landlord’s work by such entry. Should such entry prove an impediment to the progress of Landlord’s work, in Landlord’s judgment, Landlord may demand that Tenant forthwith vacate the Premises or take other steps to cease the interference until such time as Landlord’s work is complete, and Tenant shall immediately comply with this demand. During the course of any pre-term possession, whether such pre-term period arises because of an obligation of construction on the part of Landlord, or otherwise, all terms and conditions of this Lease shall apply, except those regarding the start of the Commencement Date and obligation to pay Base Monthly Rent and Additional Rent. Such Early Occupancy will not affect the start of the Commencement Date or the Term of this Lease. 3.1 Base Monthly Rent: Commencing on the Commencement Date and continuing throughout the Lease Term but subject to the Rent Abatement Period, Tenant shall pay to Landlord the Base Monthly Rent set forth in the Summary. 3.2 Additional Rent: Commencing on the Commencement Date and continuing throughout the Lease Term but subject to the Rent Abatement Period, Tenant shall pay the following as additional rent (the “Additional Rent”): (i) any late charges or interest due Landlord pursuant to Section 3.4; (ii) Tenant’s Share of Common Operating Expenses as provided in Section 8.1; (iii) Landlord’s share of any Subrent received by Tenant upon certain assignments and sublettings as required by Section 14.1; (iv) any legal fees and costs due Landlord pursuant to Section 15.9; and (v) any other charges due Landlord pursuant to this Lease. 3.3 Payment of Rent: Concurrently with the execution of this Lease by both parties, Tenant shall pay to Landlord the amount set forth in the Summary as prepayment of rent for credit against the first installment(s) of Base Monthly Rent and Additional Rent for Tenant’s Share Common Operating Expenses that becomes due under this Lease. The term “Rent” or “rent” shall mean Base Monthly Rent, Additional Rent and other sums required to be paid by Tenant under this Lease. All rent required to be paid in monthly installments shall be paid in advance on the first day of each calendar month during the Lease Term. If the Summary provides that the Base Monthly Rent is to be increased during the Lease Term and if the date of such increase does not fall on the first day of a calendar month, such increase shall become effective on the first day of the next calendar month. All rent shall be paid in lawful money of the United States, without any abatement, deduction or offset whatsoever (except as specifically provided in Section 11.4 and Section 12.3), and without any prior demand therefor. Rent shall be paid to Landlord at its address set forth in the Summary, or at such other place as Landlord may designate from time to time. Tenant’s obligation to pay Base Monthly Rent and Tenant’s Share of Common Operating Expenses shall be prorated at the commencement and expiration of the Lease Term. (a) Late Charge. Tenant acknowledges that the late payment by Tenant of any installment of rent, or any other sum of money required to be paid by Tenant under this Lease, will cause Landlord to incur certain costs and expenses not contemplated under this Lease, the exact amount of such costs being extremely difficult and impractical to fix. Such costs and expenses will include, without limitation, attorneys’ fees, administrative and collection costs, and processing and accounting expenses and other costs and expenses necessary and incidental thereto. If any Base Monthly Rent or Additional Rent is not received by Landlord from Tenant when such payment is due, then Tenant shall immediately pay to Landlord a late charge equal to 5% of such delinquent rent as liquidated damages for Tenant’s failure to make timely payment; provided, however, Landlord shall waive such late charge the first two times in each calendar year that such late charge would otherwise be due if Tenant makes such late payment within five (5) days of written notice thereof by Landlord. In no event shall this provision for a late charge be deemed to grant to Tenant a grace period or extension of time within which to pay any rent or prevent Landlord from exercising any right or remedy available to Landlord upon Tenant’s failure to pay any rent due under this Lease in a timely fashion, including any right to terminate this Lease pursuant to Section 13.2B. (b) Interest. If any rent remains delinquent for a period in excess of thirty (30) days then, in addition to such late charge, Tenant shall pay to Landlord interest on any rent that is not paid when due at the Agreed Interest Rate following the date such amount became due until paid. 3.5 Security Deposit: On the Effective Date, Tenant shall deposit with Landlord the amount set forth in the Summary as security for the performance by Tenant of its obligations under this Lease, and not as prepayment of rent (the “Security Deposit”). Landlord may from time to time during an Event of Tenant’s Default apply such portion of the Security Deposit as is reasonably necessary for the following purposes: (i) to remedy any default by Tenant in the payment of rent; (ii) to repair damage to the Premises caused by Tenant other than ordinary and reasonable wear and tear; (iii) to clean the Premises to the extent required under the Lease upon termination of the Lease to the extent Tenant has not performed such obligation; and (iv) to remedy any other default of Tenant to the extent permitted by Law and, in this regard, Tenant hereby waives any restriction on the uses to which the Security Deposit may be put contained in applicable state law, it being agreed that Landlord may, in addition, claim those sums reasonably necessary to compensate Landlord for any other loss or damage caused by the act or omission of Tenant or any officer, employee, agent or invitee of Tenant. In the event the Security Deposit or any portion thereof is so used, Tenant agrees to pay to Landlord promptly upon demand an amount in cash sufficient to restore the Security Deposit to the full original amount. Landlord shall not be deemed a trustee of the Security Deposit, may use the Security Deposit in business, and shall not be required to segregate it from its general accounts. Tenant shall not be entitled to any interest on the Security Deposit. If Landlord transfers the Premises during the Lease Term, Landlord may elect to pay the Security Deposit to any transferee of Landlord’s interest in conformity with the applicable state law, in which event the transferring Landlord will be released from all liability for the return of the Security Deposit.